Carrying and Harvesting Nuns at at the Smithsonian. - You don't know me. 1. If you were going to be immortalized at the Smithsonian by the placing of one personal item in your exhibit, what item would that be? This is going to be a biggie, because I've missed a lot. So a fact about you, a minifact for interest purposes, a youtube and a caption contest. All rolled into a giant post. ;) Hope you're all doing well! *hugs* Miss you guys!! 2. American Michael Mastromarino stands accused of illegally harvesting bone and tissues from more than 1000 corpses that were awaiting burial or cremation at funeral homes, as well as falsifying records of disease victims in order to make their limbs, organs etc saleable for transplant. That's a crappy thing to be famous for. 3. Here's the 2006 Wife Carrying Championships. You're back!! I've missed you! I might have my rings (yes, both, sorry) because I wear them everywhere and they are sentimental. After that I can't think of any other caption than a lame "Holy Roller" or something referring to The Big Lebowski. "Take that, Pins of Satan!" 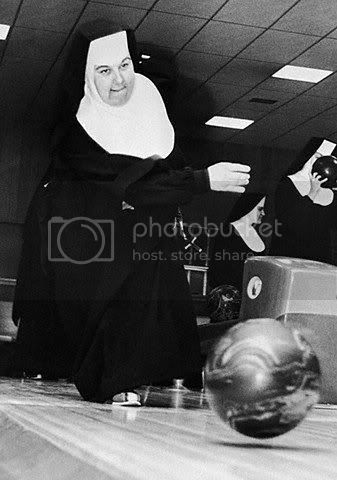 "Sisters Strike Against the Devil at the Local Bowling Alley." "I like to pretend it's the head of Samson." And... I don't know what I'd put. I guess my teddy polar bear Willy. I'm pleased to read a post from you. You've been Missed. Hope your well and that everything in RL is going OK.
Yay! Welcome back! I've missed you! I would put in a ring that my son gave me that has "Mom" spelled out with the "o" as a heart - since my son is my great achievement. "Sister Mary Margret never told a "soul" about the "deal" she made to get that 300 game"
probably one of my pairs of eyeglasses. CHURCH SPONSORED EVENT: Bowling for Blessings"
"yet another case of 'Holly Roller Syndrome', this subject went on to beat the loser of the matche's knuckles with a ruler untill she was sedated." I think you'd have to take my WWII surplus mussette bag, along with everything I carry in it: tools, nalgene bottle, pens, note pad, tape recorder, flashlight, personal higiene stuff, this list goes on. I'm defined by being able to live out of one bag. *HUGS* Mostly. :) I missed you. Spare me from temptation and deliver me a perfect score! hmm... maybe my song lyrics. i never take my necklace off either, but i didn't make it, so it wouldn't really be me, i do love it though. Does it count if it's a hand-me-down? LOL!!!!!!!!! You are so right! That's awesome. :) I hate my kidney. lol. I won't be putting it on display anytime sooon. 1. It'd be my Susie book; when I was 17 I swore I would be dead before I was 19 so I took a composition book and taped, cut, pasted, glued, drew and wrote in/on it until the pages were thick and wavy! I did this during my last year of school, so much I'd keep my scrapbook supplies in a separate purse, it was like I had an Office Max on me! It encompasses who I was at that time, who was in my life and what were my passions. 2. Kinda reminds me of the Dr. Mudd who was famous for treating John Wilkes Booth after the Lincoln assassination. That's where we get the term "My name is Mudd"
3. I need to lose weight for that! haha! 4. Sister Mary Margret discovered to her delight the pins had been painted like penguins for this event! And I did something similar, I think. I had books that I would make with a thought provoking picture, or quote or something,a nd then ask my friends to find a page that spoke to them and write in it. I have it somewhere, still, though it's ragged and falling apart. It was I guess the predecessor to Randomposting now that I think about it. Fascinating. And ooh, I didn't realize that's where My Name is Mudd came from!